Lynne Tischler is a delightful and inspiring woman. It would not be a stretch to say she is enchanting. 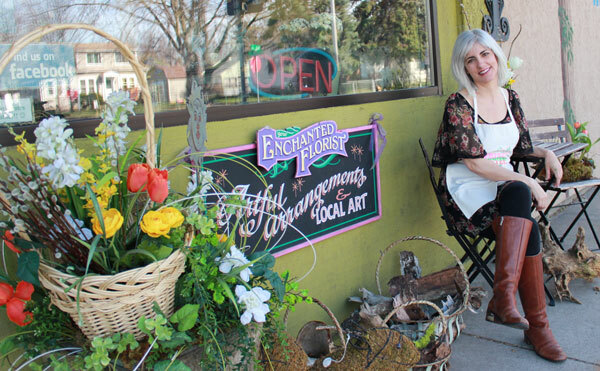 The front of her little flower shop on the corner of Dale Street and Nebraska Avenue reflects her sense of whimsy. The cheerful green exterior hints at what’s inside. The bright space is filled with art, flowers and decorations in all colors and textures. There are sparkling pieces of jewelry dangling from moss-covered rocks, striking paintings hanging on the walls, colorful knitted caps and tubes of homemade lip balm covering every surface. There are beads and mirrors and ribbons everywhere. And of course, there are flowers. In a glass case sit gorgeous floral bouquets ready to adorn someone’s holiday table or bedside. If nothing there strikes your fancy, Tischler and her crew can put together whatever your heart desires. Tischler brought her sense of beauty to a larger audience when she joined a team of florists working on the Easter holiday design at the White House in March. The team was handpicked and lead by renowned floral designer Ardith Beveridge, director of education at Koehler & Dramm’s Institute of Floristry in Minneapolis, where Tischler also teaches. The trip was a huge success, Tischler said after she returned to Minnesota. While security was predictably tight, everyone she encountered was gracious and welcoming. The team even met President Obama when he stopped by to check on their work. “We were greeted by the presidential dogs daily,” Tischler recounted. The team, which included three floral designers and six assistants, used donated product from American growers from around the country for their designs. “We worked on over 50 big and small arrangements and some were incorporated with over-sized Easter eggs,” Tischler explained. The arrangements were placed throughout the lawn for photo opportunities, as well as the guest tents and V.I.P. area. “The bench where the president and first lady read the books to the children was also decorated by us,” Tischler said. On the Monday after Easter Sunday, the floral crew took turns dressing up in egg costumes and interacted with the massive crowd. “The day was filled with lots of joy and children’s laughter—no mention of politics,” Tischler said. There were activities for all ages including yoga, painting, bookmaking, obstacle courses and, of course, the annual egg roll. “I would do it all again without hesitation,” Tischler said. Tischler has been making people’s floral dreams come true for more than 20 years. She got her advanced floral certificate in 1994 and established Your Enchanted Florist in 2002. She first ran the business from the basement of her home just a block away, then from the current building, which she bought with her husband, Randall, in 2010. They moved the existing vacuum shop, which had been in business for 35 years and which Randall now operates, to the back of the building, and moved her flower shop in. Tischler filled her shop with work from nearly 30 local artists, half of which live within walking distance to the shop. “Even the funeral ribbons we carry are created by a local artist,” she said. Potscapes—seasonal planter design for residential and commercial clients—is a large portion of Tischler’s business. She also gets walk-in business and clients for everyday occasions, as well as the ubiquitous weddings and funerals. May 3, 2016 at 12:18 pm.05.